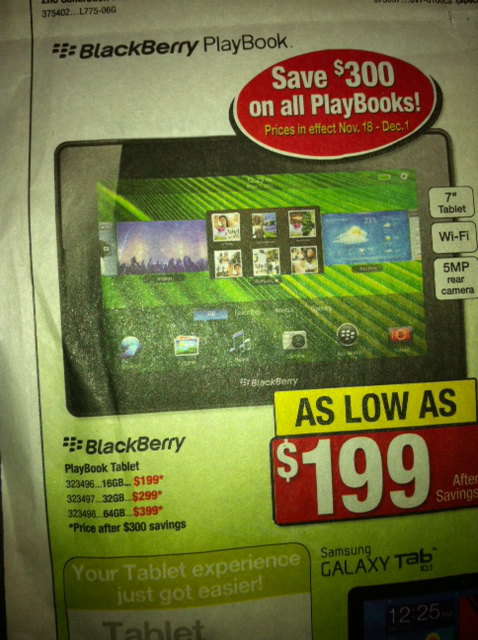 Big-box retailer Staples will begin a sale on Friday for RIM's PlayBook tablet in the BlackBerry maker's home country of Canada. The 16GB, 32GB and 64GB models of the device will sell for $199, $299 and $399, respectively. According to a photo of an advertisement sent by an AppleInsider reader, the sale will run until Dec. 1. The timing of the Canadian sale will coincide with Black Friday, traditionally the biggest shopping day of the year in the U.S. The Verge reports that Staples in America will hold a similar sale for the PlayBook. A tipster also told the publication that the price cut will be made permanent in Canada starting Dec. 18. RIM shipped just 200,000 PlayBook tablets last quarter, disappointing analysts who had expected sales in the range of 400,000 to 600,000. In September, Best Buy attempted to stoke sales of the device by offering $150 off the 64GB version and $50 off the 16GB and 32GB models. Tablet makers have found themselves squeezed by downward price pressure from low-end competition and an overwhelming preference for Apple's iPad from consumers. One report from this summer suggested non-iPad tablet manufacturers would be forced into a price war this fall as they seek to move excess inventory and cut their losses. Hewlett Packard has been the most offensive in the tablet price war. After sales of its TouchPad tablet got off to a sluggish start, the company tested out a $100 price cut. When that proved insufficient, HP surprised the industry by admitting defeat and canceling further development on the device. The company revealed that it was taking a $100 million write-off on the TouchPad and then initiated a $99 fire sale. The $99 price was apparently enough to kickstart demand for the device, even if it was a 'lame duck' by that point. Remaining inventory of the TouchPad quickly sold out. HP's competitors, with the exception of Apple, were left reeling as industry watchers predicted that the clearance sale would affect consumer perceptions of tablet value. Motorola revealed late last month that it sold just 100,000 Xoom tablets in the third quarter, with an operating loss of $32 million. Amazon added fuel to the fire when it unveiled its own tablet at the low price of $199. The Kindle Fire has especially put pressure on the PlayBook because it is uses similar hardware and is made by the same Original Design Manufacturer. The online retailer has adopted a content-focused approach that allows it to sell its tablet at a loss in hopes of making money back from Amazon Prime subscriptions and sales of digital media. The company warned investors last month that its strategy will hurt profit margins in the short term. Amazon guided for as much as a $200 million loss next quarter. The first part of Amazon's business model appears to be working, as sales of the Fire have exceeded expectations. It remains to be seen, however, whether Amazon can make any money off this venture. Reviewers have been impressed with the price of the Fire, though they don't see it as competing with the iPad. Amazon is reportedly set to ship five million tablets by the end of the year, a feat that would push it past many of its rivals in just six weeks on the market.